Opening its doors in May 1927, the Hollywood Roosevelt is a landmark hotel that has hosted events such as the first Academy Awards in 1929, has been featured in classic Hollywood films, and has housed Hollywood Royalty including Marilyn Monroe, Charlie Chaplin, and Clark Gable. This elegant hotel was conceived with a Spanish Colonial Revival aesthetic, evident in the hotel's luxury accommodations, which seamlessly blends this unique style with contemporary elements and modern amenities. 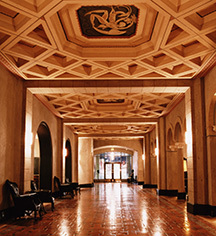 The Hollywood Roosevelt features several notable restaurants and bars. The legendary Tropicana Pool and Café is a quintessential California lounge and pool area with palm trees, sun loungers, mural-painted pool, and flowing cocktails from the bar. The hotel is also home to the Spare Room, a gaming lounge complete with a vintage bowling alley; 25 Degrees, an award-winning burger stop and diner; the Library Bar, which draws Hollywood A-listers; and Public Kitchen & Bar from executive Chef Tim Goodell. Located just a block west from Hollywood and Highland, the hotel is perfect for travelers looking to explore Hollywood landmarks including TCL Chinese Theater, Grauman's Egyptian Theater, and the Hollywood Walk of Fame. Pop art, a natural fit for a Hollywood landmark, came to the hotel in 1988. It was then that famed British painter David Hockney completed a multi-million dollar mural painted on the bottom of the Tropicana Pool, which has since been hailed as one of Los Angeles’s greatest artistic and architectural marvels. Both the hotel and the pool have been designated Historic-Cultural Monuments by the City’s Cultural Heritage Commission. 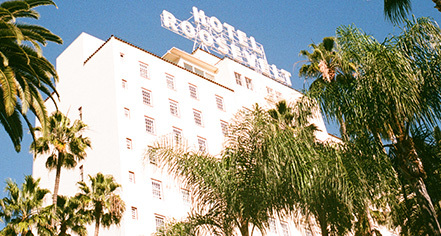 The Hollywood Roosevelt, a member of Historic Hotels Worldwide since 2016, dates back to 1927. Prince performed five shows at the hotel in 2007, which included dinner with his personal chef, a two-hour performance, and a post-set jazz jam. Pet Policy: Service animas allowed: Yes. (Fee exempt) Pets allowed: Yes. Transportation: Limo or Town Car service may be arranged through the concierge; rates apply. Opening its doors in May 1927, the Hollywood Roosevelt is a landmark hotel that has hosted events such as the first Academy Awards in 1929, has been featured in classic Hollywood films, and has housed Hollywood Royalty including Marilyn Monroe, Charlie Chaplin, and Clark Gable. Learn more about the History of The Hollywood Roosevelt .